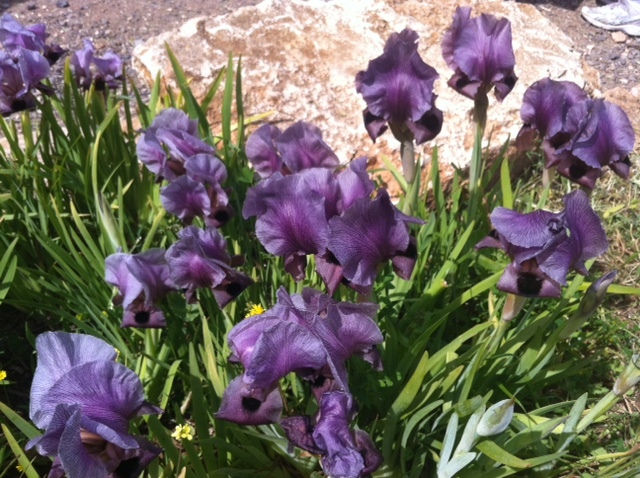 Right now is the perfect time to see the gorgeous, purple flower, the Gilboa Iris on Mt. Gilboa in Israel. This splendid flower blooms from February to late March and is also known as Iris Haynei or Hayne’s Iris. This is a “protected” flower in that it is there for you to see and photograph, but not to pick for your spring bouquet. The Gilboa Iris is so popular, that it was made the logo for the Society of the Protection of Nature in Israel. The Gilboa is a mountain range in between the Jezreel Valley and the Jordan Valley to the east. Looking down from the mountain range you can see the Jezreel Valley, also known as “Israel’s breadbasket” and see the fields of wheat, cotton, sunflowers and the Israel’s famous fish ponds. A visit to this part of Israel is alive with stories from the Bible. We have the story of Saul, the first king of Israel and his troubles with the Philistines. In the Book of Samuel 1 28:4 he consults with his local necromancer, the witch of Ein Dor, ( a kibbutz nearby) to ask for her help. She raises up the soul of the prophet Samuel, but things don’t go well for Saul and he commits suicide on his own sword (Samuel 1 31:4). Also at the foot of the Gilboa is the spring of Ein Hod. This is where Gideon chose his best men to fight the famous battle against the Midianites. (Judges 7:4-6).